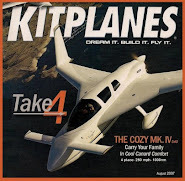 If you're going to build an airplane, you have to have a place to build it. I chose to convert my two car garage into an aircaft factory. I know that if the airplane isn't close, then I won't work on it as much as I could, which of course means it will take a lot longer. My goal is to do something every day, no matter how small, toward the completion of the Cozy. 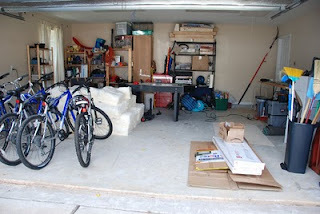 Here is what the garage looked like as I started. You can build all the major components in the space of the garage. You can't attach the wings (which are designed to be removable if needed) but you can build them and then rent a T-hanger at the airport for final assembly and checkout prior to first flight. As you can see I had stuff all over the place. It had actually already been cleaned some. The fiberglass you see in the floor was to go in the attic above the garage as part of insulating the garage for winter building. Still quite a bit of other work to go to make a suitable building area.